I'm convinced that many of life's greatest moments and lessons learned happen in places like Dunkin' Donut. I have literally been marinating recently in the reality of how truly blessed I am and how that should and must produce a generous heart. One of the things I most despise, when it surfaces in my own behavior or attitude is a spirit of ingratitude, or those brief moments of thinking that "I deserve something." My wife and are are working hard to be shaping forces in the life and character of our children, and this issue of gratitude is a really big deal for us. A few weeks back I picked up my three children from school and headed to Dunkin Donuts. We get jacked up on sugar then head to the park expend all the energy (that part probably isn't good parenting!). I am a softy sometimes, so when they asked for two donuts a piece, I didn't think for a moment about any future metabolic slow downs in their lives or how much more expensive the two doughnut per kid trend would be and I said "Sure." Maddie's doughnuts looked really good so I asked her if I could have half of her "SECOND" donut...the doughnut I purchased I might add! She quickly and definitively declined. "No I want both of them"....I could barely understand her because her mouth was full of doughnut. This spurred a lengthy discussion (more of a discourse) about kindness, generosity...how everything in our world is God's, and because we have been "given" so much we should be quick to give to others. I must say it was a quite impressive mini sermon with a captive audience of children who had donut icing all over their faces. I had nailed this parenting moment! This is the stuff parenting books are made of. So feeling confident about the compelling nature of my discourse I asked again, "Maddie, now can I have half of your doughnut." Just as quickly and just as definitively she said "No I still want both of them." I never mentioned the incident to her again, but honestly it was frustrating. About a week later, on my way to work I was praying for each of my children by name. When I prayed for Maddie, it felt as though God gave me the words to pray for her about generosity and gratitude. I prayed that God would help me to do my part in shaping her character but that "ultimately" He would produce in her a generous spirit...a spirit of gratitude." It was our Dunkin' Donut day and I had completely forgotten about my earlier prayer. Due to "budget cut backs" we grabbed one doughnut a piece. As I was paying for the doughnuts I felt a tug and heard the words "Here Daddy." I looked and Maddie had torn her doughnut in half, and was holding half up for me. My heart swelled...and if you are wondering the answer is NO---I didn't eat half of my daughters only doughnut. Immediately, God reminded me of my earlier prayer. It was as if He was saying to me "You do your part AND when you pray, I will do my part." When I couldn't force her to give up one of her two doughnuts, here she was giving me half of her only doughnut. It may seem like a small thing...but it is no small thing as a parent to know that God is interested and willing to participate in the character development not only of "our children" but also of "his children". While many of us have done what we can do with our children, our jobs, our marriages/relationships, our lives, we have yet to see what God can do with them when we lay them at his feet. God fill me with a heart of gratitude. Help me to give much and often. Proverbs 18:16 " A gift opens the way for the giver and ushers him into the presence of the great." Ben Richter and his band lead worship for us tonight, and did an incredible job. All you children of the 80's will be singing the opener "867-5309/ Jenny" all week whether you want to or not! What a fun night,. What a helpful biblical concept. What a refreshing way to do church. What a privilege to be a follower of Christ! These two "beginnings" simply belong together....the beginning of a church and the beginning of a blog! It's poetic. 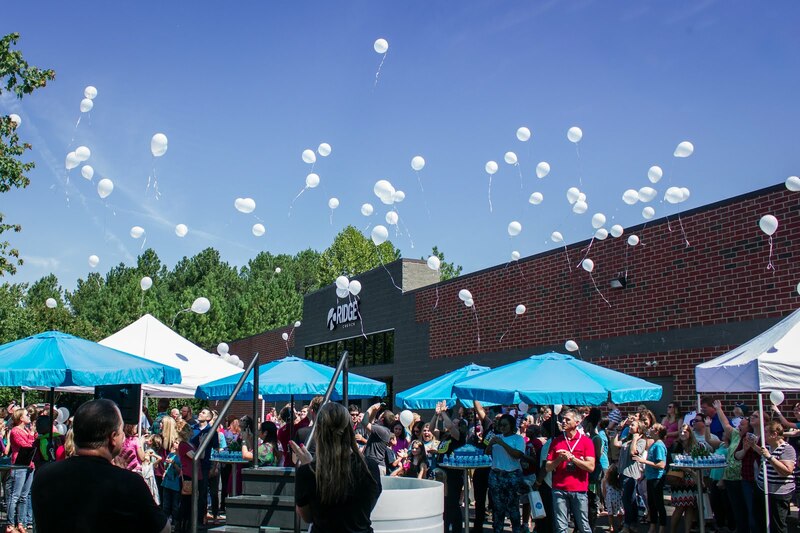 Just a few short weeks ago we opened the doors of ridge church to the public. Literally years of personal and corporate prayers and preparations went into the formation of Ridge Church. I can't explain the excitement we all felt...the anticipation as we opened the doors and silently thought "We hope someone shows up!" And they did! The journey for ridge church did not begin with our public launch but is was a definite marker...a milestone in the journey. One of my colleagues, Carey Nieuwhof, recently said about starting ridge church "I hope that it is much more than a fun ride...I hope it is a deep meaningful experience" Wow! That is our prayer and gratefully our experience so far.